A controversial Mount Dennis $250,000 art project is finished and was unveiled last night. “Nyctophilia” is a collection of streetlamps with bulbs of different colours—and in the daytime at least, it’s not pretty. 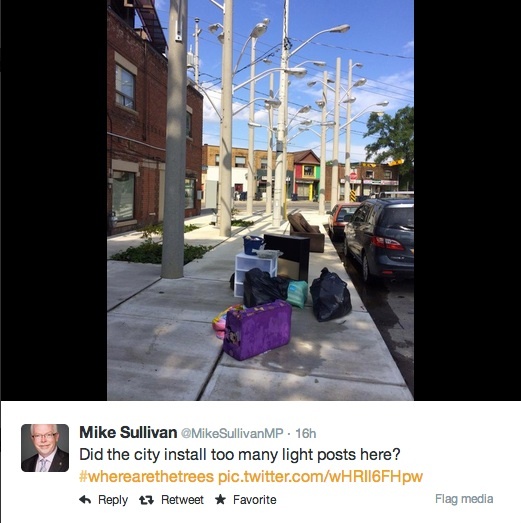 Mike Sullivan, our MP, was a bit indirect in his criticism, but his comment “wherearethetrees” sums up, I’m sure, the critics who think that this art is too urban in an already urban place. That’s not bad, not bad at all! Maybe I’m stretching a bit here, but I think this art is ugly and urban and hides its potential—only to transform overnight into something beautiful and a little startling. I think it fits right in in Weston—Mount Dennis. Thanks to KR for the tip. I know the whole thing with post-modernist art is that it’s supposed to reflect its “context” but do the ordinary residents of one of the most economically depressed parts of the city have to be unrelentingly reminded of the brutality of their little piece of the urban landscape in order to satisfy our political masters’ desire to appear cutting edge and progressive? With respect Adam, yeah, at night it is “a little startling”, in pretty much the same way as if I dumped a box of Christmas lights on my lawn and plugged them in. Maybe the drug dealers will have something to ponder. I would have to admit though, that the work is successful in satisfying the other great post-modern litmus test – irony; ironies are piled upon ironies here as the City has wasted $57k of public money to glorify their own failure to create and perpetuate a humane public realm. Disgusting to say the least..250k of developers money wasted in an area that lacks do much…..disgusting…this was all nunziata…..
Public money should be used to improve public life: the night life in Mt Dennis isn’t improved, and drug dealers don’t need art. We need so much more genuine attention, instead of grandstanding to glorify politicians. Bad judgement and culpable ignoring of the reality of life in the neighbourhood. Do you think nunziata really cares about what the few same posters have to say on westonweb? She will win again and the same complainers will be still support her…..
Adam, at night! What about the crime!!! Next Weston web crime watch, man mugged while staring at new Mt. Dennis art. Come to think of it, the whole thing might have been set up as a decoy.